As we're solidly in the middle of winter, it is a great time to be thinking about the wild creatures who are surviving the winter outside. 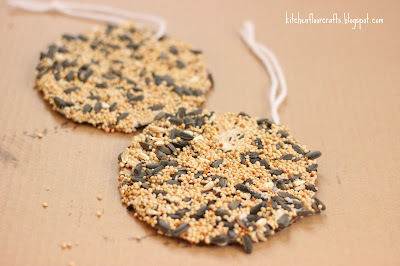 We decided to create some easy cardboard bird feeder treats to hang outside for the wild critters in our neighborhood. If you've been reading our blog for a while now, you know we love projects that use materials you can easily find already at home or at a local store, and this project is definitely one of them. I traced a circle shape onto a piece of cardboard from our recycling and pre-cut the circles using our kitchen scissors. 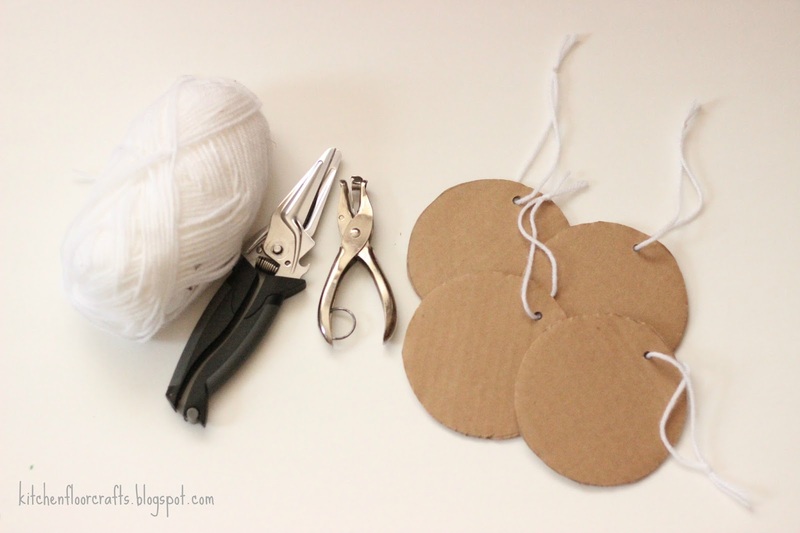 Using the hole punch I punched one hole on the top of each circle and threaded yarn through it to make a long loop. For each kiddo I set out a tray with a cardboard circle, a small bowl of crisco, a plastic knife, and a spoon. 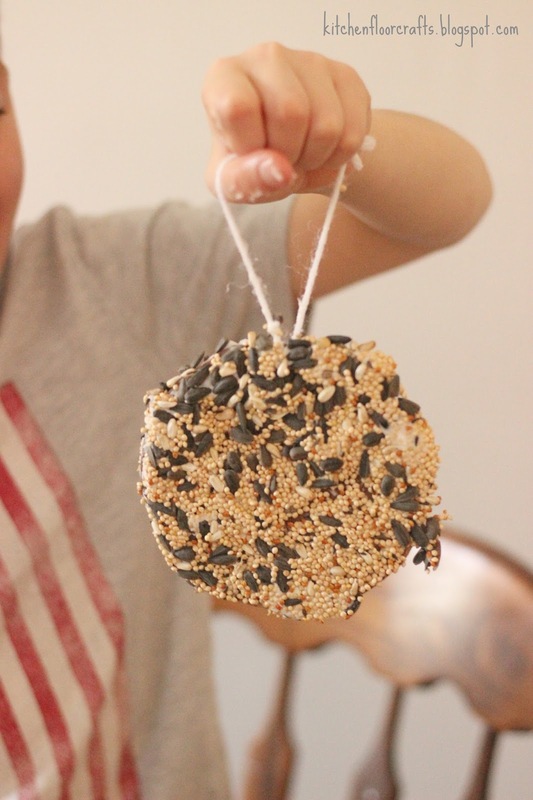 The boys set to work to create their bird feeders. 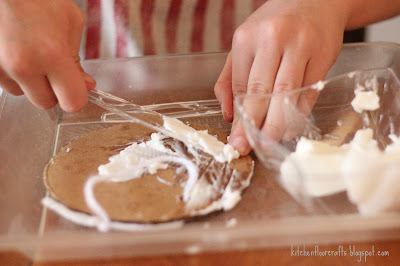 Using the spoon they scooped Crisco onto the cardboard and spread it with the knife. One beauty of this project is that the shortening does not have to be spread evenly, it can be a little lumpy and still work out. They also discovered that sometimes the back of the spoon was actually the best spreader. Using both the spoon and the knife helped the boys, especially Little Brother, work on their fine motor skills. 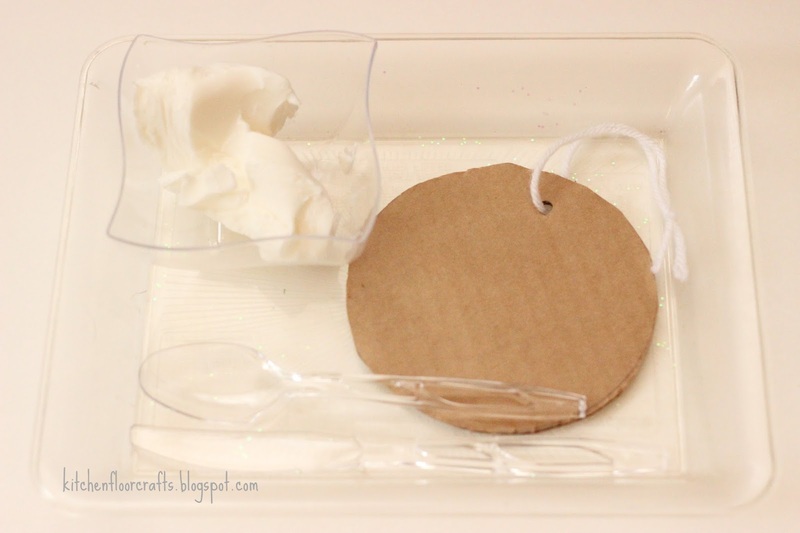 I should add that even with the utensils, this part of the project got a little messy. But luckily, it can all wash off hands with a little soap and water. 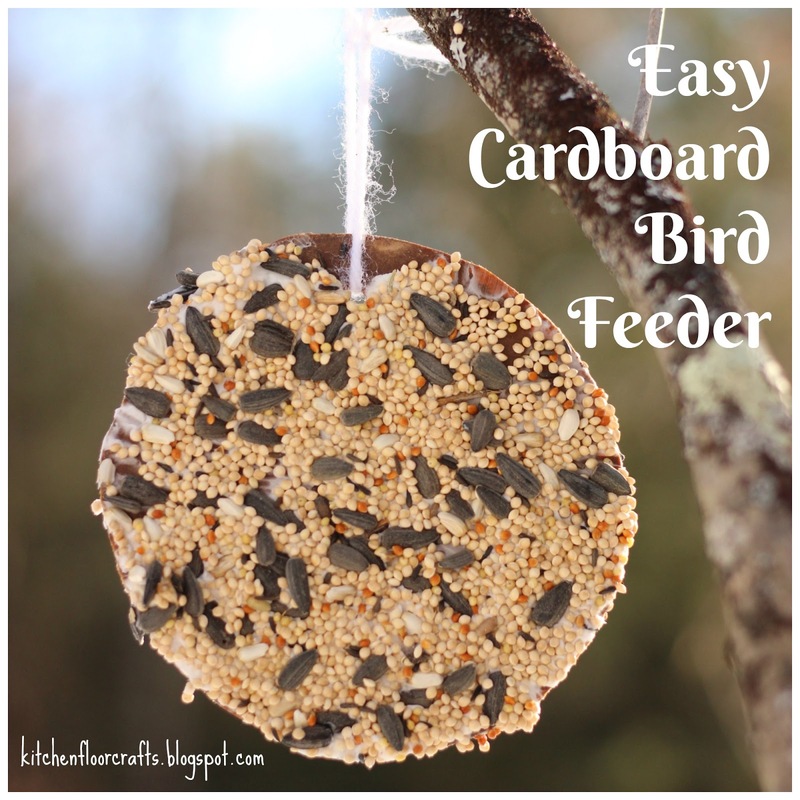 When the cardboard was fully covered with shortening, we filled another shallow tray with the bird seed. The boys carefully picked up and flipped their circle into the bird seed. 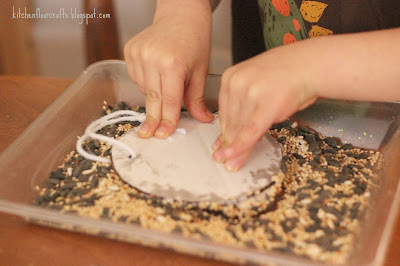 Using their hands they gently pressed the circle into the bird seed. The pressed in several places so they knew the whole circle would be covered. When they lifted the circle out of the tray they had a finished cardboard bird feeder! The project was pretty quick (less than ten minutes) so the boys quickly made a few more bird feeders. 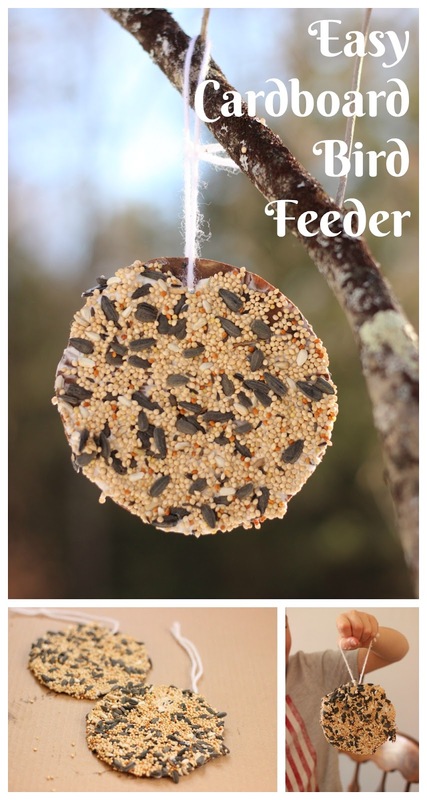 We hung our bird feeders outside in a couple of trees near the windows, that way we could see what wildlife they attracted. So far we've only seen a couple of large squirrels feasting on our treats. But, the boys were fascinated to watch them. We're looking forward to seeing what other creatures our cardboard circle feeders can attract.